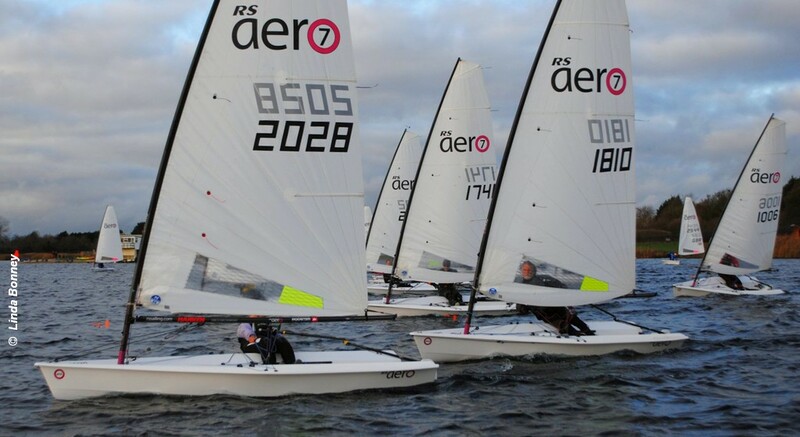 Thirty RS Aeros entered for the Bowmoor Bubble, the first event of this winter’s RS Aero UK Winter Series. The rain stopped soon after rigging and the 30kn gusts never materialised, leaving a pleasant days racing in a medium breeze. The Bowmoor RS Aero fleet continues to go from strength to strength. They now have 23 RS Aeros at their club which made up half of the overall entry at their Bubble open. They are also a great racing fleet, taking seven out of the nine podium places from the day’s racing! Emily Watson won the RS Aero 5 event with three wins from the four races. Second was Fi Lucas and third Rosemary Dillworth. In the Aero 7 event, Chris Hatton tied for the lead with Charlie Sansom, each wining two races, with Hatton taking the overall win. Nigel Rolfe from Burghfield SC took third place. In the Aero 9, Peter Barton from Lymington Town SC took three race wins to finish one point ahead of Dave Lynall with Al Keck in third place.